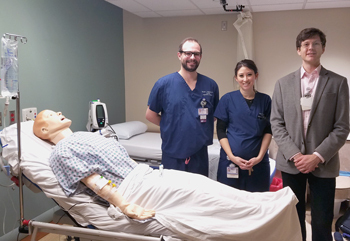 WISER had the opportunity to participate in a course assessment activity at UPMC Presbyterian in the Department of Radiology. This assessment was evaluating the patient care outcomes and long-term knowledge retention of participants who have taken in the Radiology Contrast Reaction course taught at WISER, to those providers who have yet to participate in the program. Pictured are Michael Magnetta, MD, Alisa Sumkin, DO, and Alexander El-Ali, MD, Course Directors, and instructors for the Radiology Contrast Reaction course. We would like to thank them and the other Radiology Contrast Reaction course directors (Andrew Klobuka, Mike Dressen and Ryan Anderson) for their dedication and commitment to this quality and safety patient care program.